The We Are Respectable Negroes News Network (WARNNN) works hard to bring you, our readers, the stories and information that you care about most. In the three years since our founding, we have had the good fortune to bring you candid interviews with such public figures as Jesse Jackson and Pat Buchanan. One of our greatest coups was an exclusive interview with the nebulous figure "Racism." And of course, Brother X-Squared made his Internet debut on our site. During the last three months, WARNNN has been in secret and delicate negotiations with one of the most important, but little understood, figures in contemporary American politics. With the rise of what some have labeled The New Right, this individual has risen to prominence and accrued power that few would have imagined possible. After a fitful series of off the record conversations, covert exchanges, and overcoming a real fear of the repercussions of this interview for his personal safety (as well as that of his family), we are proud to present the silent partner in Glenn Beck's success. 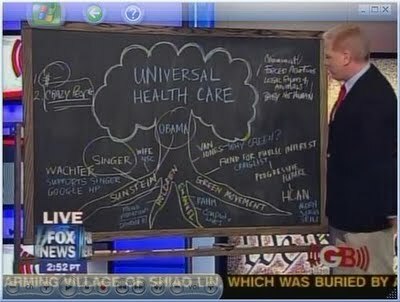 In an exclusive interview, Glenn Beck's blackboard is finally prepared to pull aside the curtain and reveal all that he knows about his partner's meteoric rise to fame on Fox News. WARNNN: We are so happy to have you on the show. I know this was hard for you to do and we have talked many times off the record about your feelings regarding Beck and the rise of The New Right. Given that you have been working with Glenn Beck for several years now, please explain to our readers your timing. Why now? Why do an interview with us? What is driving your decision to come clean, for lack of a better word. Blackboard: I mean this has been really hard for me to do. I know that there will be repercussions for my speaking with you. I have a family that I support. With this economy it is so hard to get reliable work and this gig quite literally came out of nowhere. One day I was sitting in a storage room, praying that someone would find me still useful. With all these computers and PowerPoint and other such "progress" it is hard for a traditionalist like me to get work. The next day I am on Fox News with millions of viewers, tens of millions of people watching me. But you know, I am a patriot. You know what I mean? I really love this country and sometimes it is just so hard to be involved with Glenn Beck and this Tea Party nonsense. The last six months, well even before Obama got elected, he has been unhinged. But as of late it stopped being a game for me. Yeah, I cash the checks I get paid, but he has gotten more and more crazy. Quite frankly it scares me. WARNNN: Is there any one specific event that has pushed you this far. I know that in our talks over the months you have relayed how you are physically afraid that something could happen to you at Glenn Beck's hands. Is it this fear, or is it something else? Blackboard: I know that Beck is building up to some great theatrical moment where he goes on a rant and smashes me or one of my brothers with a hammer. I am living on borrowed time. I get that. The breaking point for me was the domestic terrorist who was going to shoot up the ACLU and the Tides Foundation out in California. That story didn't get a great deal of press, but when I heard about it, I felt sick. How many times did Beck use me to talk about that group? Ten, twenty, thirty, maybe more? There have been lots of shootings linked to Glenn Beck and his rants. At first, I just brushed it off. You know how denial works, you come up with all sorts of other explanations...maybe these are just crazy people? Or they would have shot up the police or a museum anyway, so my hands are clean. But after a point it is just obvious that Beck and his Right-wing people are trying to create chaos. I don't want blood on my conscience. I really really don't. And trust me, I have been in the production meetings, I hear what Glenn and his people are planning. They are going to get more and more extreme. One day, and you have my word on this, something very bad is going to happen. Beck will get on television and deny that he had anything to do with it, or that "progressives" were behind it. You can take that to the bank. WARNNN: In one of our talks a few weeks ago you mentioned the race baiting and the black people are racist against whites narrative that Beck has been pushing as of late. Can you share your feelings on that? Blackboard: That hurt me too. Come on now, as a person of color, as a black board in particular, I was disgusted by the whole thing. It gets tired, how he keeps talking about the New Black Panthers and Obama hating white people, and drawing these twisted diagrams where every black person is somehow connected to Farrakhan, or communists, or some nonsense. But I am there to do a job. I am not there to voice my opinions. But beyond the racism, I was more upset by how he could bring prominent black professors and other learned people on the show. Man that got me. I have paid my dues in this business. To see smart people who should know better encouraging Glenn's ad hoc conspiracy theories sickens me. But who am I to judge? I wanted to get paid so I did what I had to do. Those professors and others must be thinking the same thing--go on Beck and you get on The New York Times best seller list. Money talks. WARNNN: As a detour, and because I think your history is so fascinating, can you share a bit of your lineage with our readers? Did your family's legacy have anything to do with your finally deciding to go public? Blackboard. My family got to America in the early 1800s. It was a really exciting time where we were the newest things on the block. We were very prosperous and successful. I have relatives who worked at all of the major universities in the country. Great minds. Sharp people writing on us everyday, us working to communicate with and teach young minds. I think for me that was what is driving me to talk to the public about Glenn Beck. I know real intelligence and sharpness when I see it because I have worked with some of the best. Beck is a fraud and I just kept thinking to myself that I am better than this. I really got to thinking about my family. 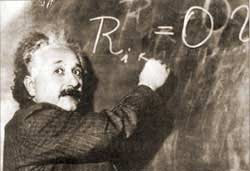 Did you know that my grandfather worked with Albert Einstein? I kept thinking how would he have felt about what I am doing now. Enabling Glenn Beck and his violent, conspiracies. I don't think my grandfather would be proud. No, I know for a fact that he wouldn't be happy with me. Money matters, but personal integrity counts even more. WARNNN: You used an interesting phrase. Blackboard, you said that you "enable" Glenn Beck. Can you clarify that a bit for our readers? Blackboard: Think about it. Could Glenn Beck do his professorial shtick if it weren't for me? Come on! Imagine him doing his performance with a whiteboard or PowerPoint. It wouldn't work at all. Beck would just be a crazy man who could just as easily be on the streets of New York or Chicago walking around with a placard screaming "the end is near!" Me and my people, the blackboards Beck uses, we give him his credibility. Take us away and Glenn Beck has absolutely nothing. Nothing at all! WARNNN: Playing devil's advocate for a moment. Some would say you are jealous, a "hater" of sorts. That you are the silent partner and are resentful that Glenn Beck gets all of the attention. Blackboard: I opened this interview by explaining how much I love America. I went from being semi-employed to having one of the best gigs on television. I am the only blackboard in the country doing what I do on a nightly basis. I have fame. I have more money than I could ever ask for. No, this is about my conscience. Folks need to speak out against The New Right and Glenn Beck. These are trying times. America is in real trouble. I do this in the interest of justice. WARNNN: Fair and honest. Please share with our readers what you told me about the behind the scenes activities on the show. What have you seen? Blackboard: There will be volumes written on the scene that is Beck's show. He has cultivated this wholesome, Christian image for himself. Whatever, being vague for legal reasons, that show is a cult of personality and his guests and crew are enjoying it for all its worth. When those lights go off the party is just beginning, trust me. What gets me the most, and maybe your readers may not appreciate this, is how pornographic and intimate Beck's performance really is. He brings you into his little twisted world, looks you in the eyes, talks about saving you from the monsters under the bed, and then builds to a near orgasmic crescendo. For me as a blackboard, what is the worst part of it, and I am a married so this is hard for me to talk about, is how Beck uses us two, three, or four at a time. Chalk everywhere, misspelled words, moving around us all. So disgusting. I feel nasty even talking about it. Beck is so uncaring and vile at times that he leaves us there overnight, unwashed, covered in his handwriting. I can't begin to tell you how soiled that leaves you feeling. WARNNN: What would you like our readers to do? What should they know? Blackboard: I think you should stop watching him. Beck only gets his power because of the attention he receives. And don't for a moment take him lightly. Beck really believes everything that he is saying. Over the last year or so, Beck has become messianic. All that stuff about Dr. King is sincere. Beck believes he is here to continue Brother King's legacy. Those talks about revolution and such. Beck really thinks he is going to be martyred. I am relatively voiceless. I can speak with great care and through venues such as WARNNN, but really all I can do is non-violently resist. I can try to deflect Beck, smudge his words, makes things a bit confusing for the viewer but that is all. You have to stop Beck and The New Right. This is the responsibility of decent, reasonable Americans everywhere. As I said, I may not have long for this world--especially once Fox News and Glenn hear about this interview. But, I did what I had to do. I can go off to my destiny with a clear conscience. WARNNN: We really appreciate your courage. You will be in our thoughts and prayers. Please be safe. Blackboard: Thank you, and I will do my best. "Chalk everywhere, misspelled words...he leaves us there overnights, unwashed, covered in his handwriting." I hate to Godwin this, but in the 1930s, a lot of British and American media joked about 'that paper hanger' in Germany. I just can't tell if Glenn Beck is an amoral performance artist like Rush Limbaugh and Anne Coulter, or if he's crazy like Sarah Palin and Michelle Bachmann. Either way, someone who rolls back the crypt stone for Skousen's poison is dangerous. Thanks for this in depth interview, one that I'm sure no other news organization would ever have done! Please keep up the great work and tell the Blackboard for me that I really appreciate him risking so much in the name of truth! Glenn Beck is a sociopath in my opinion, he could care less about the country, politics, religion, honor, and most importantly TRUTH! All he cares about it money and he will lie, cheat and steal for his own monetary gain. That makes him so much more dangerous then most of the other right-wing-nut-jobs! ps. can you guys add a twitter link to your posts. It would make it so much easier for people (at least me) to share your articles with others on twitter!